Quora gives you 500 credits to start. You can earn credits by answering an Ask To Answer request, by getting upvotes on answers or posts you’ve written, or if someone gives you credits. For every upvote that you receive for an answer or post, you will receive 10 credits. This is even true if you wrote the answer anonymously. When someone who you Ask to Answer a question write an answer, you will receive 5 credits for every upvote that answer receives. The primary usage of credits is the Ask To Answer Suggestion function, where Quora will suggest users to you that you can ask to answer a question. Each user who is not your friend (you are both following each other) may have a price you must pay in order to ask them to answer. You use your credits to send them Ask to Answer requests. 25% of this price is paid to them immediately, and the remaining 75% will be paid if they respond with an answer within a week. You can give credits to other users, but you must have at least 500 credits in your account. For example, if you have 570 credits, you can only give up to 70 credits to someone. If you later receive more credits, you can then give more. The reason for this is because every user starts out with 500 credits, and Quora doesn’t want people to create multiple fake accounts just to send the initial 500 credits to a single account. You can give credits to any user for any reason, and you can send a message along with the credits. When you upvote an answer or post, the author receives 10 credits, but you don’t spend any of your credits. Yes, this is how credits are “created” in the economy (in addition to system refreshes). If someone pays credits to ask you to answer a question, you will immediately receive 25% of that fee, and you will receive the remaining 75% if you answer within a week. This 75% is the amount that the system says in the “earn X credits by answering” notification that you receive – the 25% has already been given to you. The number of credits it costs to ask you to answer a question is determined by the rate of incoming requests that you receive. This gives you a maximum price, which you can adjust to any number of lower thresholds on this page: http://www.quora.com/asked_to_answer – click on the “Asking you to answer costs X credits” link. If you give credits to another Quora user, there is no way to reverse this transaction. You can make money off your friends if they are prominent people whose answers tend to get upvoted out of proportion to their answer’s inherent quality (e.g. Quora staff, famous people) by asking them to answer for free, and then collecting the 5 credit/upvote reward that you receive for being the one to ask them to answer. If you are following someone and they are also following you (i.e. you are “friends”), it is free for each of you to ask each other to answer questions. Therefore, a potentially cost-effective way to get an obvious-but-highly-priced person to answer is to ask someone who is their friend who is also your friend to answer it – it will be free to ask your friend, and they may subsequently then ask the other “obvious” person to answer. If you are offered a very high bounty to answer a question but don’t really want to give an answer (or can’t come up with a good one), you can write a crappy short answer and then immediately delete it. You will still be awarded the bounty. Keep in mind that your answer will still generate a notification, and this seems like something Quora would fix pretty quickly somehow. If you happen to be on a question page and you see that someone is in the process of writing an answer (“Currently Answering”) but they haven’t posted it yet, you can quickly ask them to answer and, assuming they end up posting the answer they are writing, you will receive credits for each upvote the answer earns. This is a lower-risk way of trying to draft on peoples’ answer upvotes because you can be relatively assured that they will probably finish and post their answer. Got a tip about Quora credits? Add it to the comments below! Disclaimer: I’m just a grad student in an unrelated field. This is about information consumption on Quora. I won’t say much about the site’s social side. People forage for information on Quora. It’s different from StackOverflow, where people dip in, and Wikipedia, with its sterile content. Foraging on Quora is more rewarding, because the quality of the thinking is occasionally very high. Foraging is structured by Quora’s feed – adjacent entries in the feed can lead down very different roads. The feed is tightly personalized, with a little randomness thrown in. Users who follow the feed’s cues will diffuse around Quora. Occasionally they will stumble into a new area. There is a natural length scale to their movements: the range of the people and topics they follow, because that’s what sets the breadth of their feed. This is like Brownian diffusion. 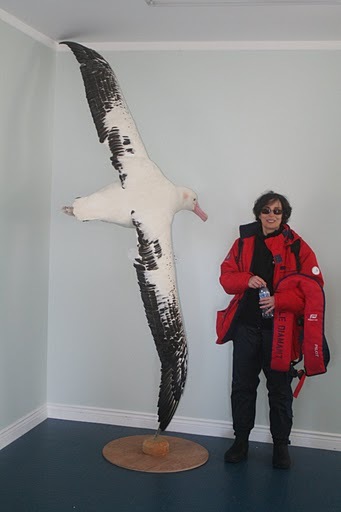 As an alternative, consider the albatross. where l is the length of the foraging flight, and P(l) is the probability that the hop will be that long. This scale-free pattern (including the exponent -2) has since been found in sharks, microplankton, penguins, sea turtles, bumblebees, spider monkeys, butterflies, honey bees, fruit flies, and amoebae [2,3]. This is called a Lévy flight. Sounds like Quora. By manipulating the environment, exponents between -3 and -1 can be produced in ecological simulations. However, including a “crowding” effect (evaporative cooling?) does not affect the -2 exponent, at least not in mussels . Much of the interesting content is coming from people who pop up, write a few dozen excellent answers, and then either leave or start producing mediocre content. This makes the system dynamic. To find these nuggets in your feed, you need to rove far and fast. It’s unreasonable for users to apply Lévy flight behaviour themselves. This is because Quora is a murky fog of information, not a savanna. The “sightlines” are short, intentionally so, so users have to be tenacious and read many two-line answer previews before they find a truly interesting answer. To bring Lévy flight behaviour to Quora, the company would have to take the lead, by changing the feed. Brownian motion makes sense for “campfire” social networks, and for Wikipedia. The kind of people who could make Quora great are allergic to sameness and want intellectual challenge. They need Lévy flights. What would a Lévy-flight personalization system look like? Add a Lévy-flight component to that user’s feed. This is not just randomness, because increasing distance from the user’s preferences will always decrease P(l). Keep tabs on each user’s revealed preferences. 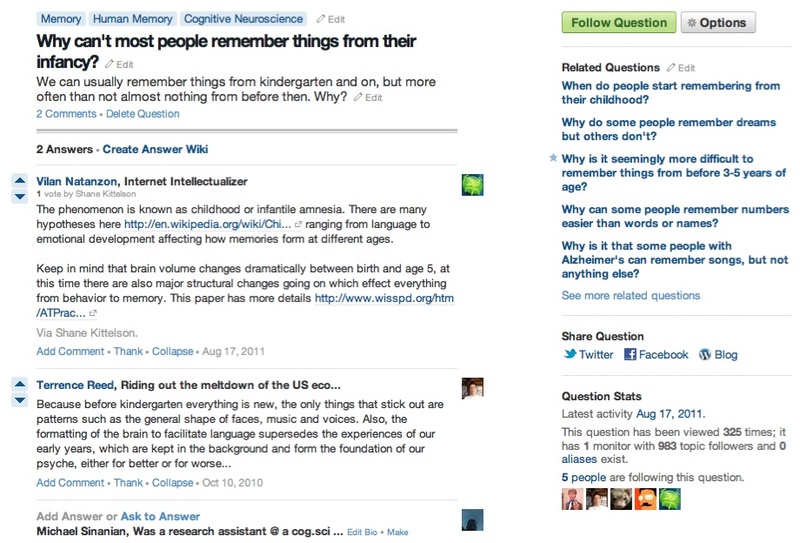 Some will treat Quora mainly as a social network – keep “campfire” personalization for them. Some are foragers. Some will be in between. I guess the comments/PM ratio could be a tracer of this. Openness to experience is one of the Big Five personality traits, so the power-law exponent could be adjusted based on overall assessed openness. Finally, all Lévy flights are super-diffusive – the mean-squared distance from the origin increases nonlinearly with time. In contrast, Brownian motion gives linear growth in mean-squared distance. Quora’s collection of questions and answers is growing faster than the diffusion of high-quality users away from their origin points. The resulting isolation is demoralizing. Celebrities, for example, are encircled by baying fans and rarely meet another celebrity. Lévy flights can fight this. TL;DR: Quora’s feed favors campfire behaviour over foraging, which is bad for some users. Adding a scale-free factor would help Quora retain novelty-seeking users. Sims et al., “Scaling laws of marine predator search behaviour,” Nature, 2008.
 de Jager et al., “Lévy Walks Evolve Through Interaction Between Movement and Environmental Complexity,” Science, 2011. (PM me if you can’t get hold of journal articles). It was in 2006 when Facebook had registered its 12 millionth member, rolled out the controversial news feed and launched its official development platform. That was also when Justin Smith decided to found his “Inside Facebook” blog, the first news site dedicated solely to tracking the social web’s most prodigious product and business. Will The Quora Review (TQR) spawn the same string of daily analytical pieces, research reports and even conferences that Inside Facebook did for their patron company? At the time of Inside’s debut, Facebook had just become a platform, a world unto itself, which made a third-party dedicated news site a viable enterprise. Quora has not yet become that type of all-encompassing platform (and it may never be), but its service is so enticing that it has already spawned TQR. Today we ask: why, and ultimately for what? As you may have already realized, answering questions (even about itself) is Quora’s raison d’etre, so for what purpose would we frequent a site like TQR? Surely we could satisfy our craving for Quora news, analysis, events, corporate developments, and product innovations from within the site itself! Yes, and no. It was Edmund Burke who famously labeled the Press the “fourth estate” of civil society, and in this same manner, we must examine TQR as the fourth estate of Quora’s Internet society (or “information community,” if you prefer). It might not be glaringly apparent to us now, but eventually Quora, like all other societies, will have its fair share of internal politics, agendas, opinions, and influences: hallmark maladies of a boisterous community that could incentivize power-grabs through placation of the society and its members. The French Revolution, after all, was indebted to quite a few of those salons! In stark contrast to dedicated business/product sites like Inside, and what TQR has been up till now, I’d like to bring to light The Daily Dot, a recently founded media startup that aims to be the “hometown newspaper of the Internet.” Their angle isn’t tech news; it’s the community of people that call the Internet their home, that sort of inhabit the vast corners of the Net. In this manner, they want to cover the Internet symbiotically, in the way that a daily town newspaper covers their community, benefitting their local readers through their coverage while profiting from ads or subscriptions. Take for example the recent “Answer Improvements” development. While this could be discussed and debated within Quora (and it is, through a near-unanimously positive comments thread), wouldn’t a third-party forum for discussion be more appropriate? TQR could offer that type of outlet, external to the patron site’s own administrative designs and wishes. We are the community after all, and TQR can be our impassioned voice of criticism and reason. In the end, Quora’s product versatility could easily support discussions about these internal issues, but being a community newspaper has the legitimacy of being the fourth-estate, the great moderator. That alone makes TQR more valuable. As such, this site should embody the fourth-estate principle and provide coverage that lives up to such integrity, if only because Quora itself is a community, a society of sorts. In the vein of Inside Facebook, there should of course be plenty of coverage about Quora as a product and business; its own vitality depends on it. But we’ll also gather around TQR to discuss the community, the everlasting fabric of Quora that makes it all worthwhile: the curious people, the probing questions, the scurrying users who auto-curate, who debate. We’ll be with them. As Quora users go, our next subject is pretty rare specimen. A working chef with encyclopedic knowledge of the chemical interactions that go into cooking, who somehow has the time to write as much as he does on quora and his own blog, feastcraft.com: Jonas Luster. As a working chef, how the hell do you find time to write? I am writing this on my Xoom while watching my stocks and sauteeing some onions for a dish. Since I got this marvel of technology, I have become rather adept at writing in chunks, dropping a few lines here and there, until something decent emerges. That sometimes leads to rather … disjointed … paragraphs which I have to fix after giving them the once-over. Or, horror over horrors, I might miss them. Recently someone wrote something to the effect of “this is such an egregious error, I have to question your whole answer”. He’s right, of course, but the mistake was to continue writing a sentence that I’d started an hour prior. When writing your answers, how much of the food science comes off the top of your head, and how much is researched? Where did you pick up all of your scientific knowledge? Given your evident interest in chemistry, are you particularly drawn to “molecular gastronomy” kind of cooking of Ferran Adria, Grant Achatz, and company? Is it a direction you would go yourself? One of my heroes, Hans Heinrich Euler, once said “If we understood the Universe we could make it better or completely remake it into a new one”. I don’t have as much interest in making a new universe as I have into making this one (culinarily speaking) a better one. I believe that a lot of culinary dogma comes (again, religion comes to mind) from misunderstandings and simplifications. If we understand food, we can make better steaks, reduce waste, sautee better asparagus spears, and take the pain out of complicated sauces and dishes without sacrificing taste and healthy properties. Take the “63 degree egg” for a second. For centuries people have devised better and better methods to establish the time an egg has to be in water to be of a certain consistency. A little bit of science, the “Chem 101” version, teaches us two things – egg whites firm up under lower temperatures than egg yolks, and egg yolk assumes a “soft boiled” consistency when it reaches 63 degrees for three minutes. The only question left over is, does it firm over time or temperature and, a few experiments later, Herve This figured out that time played no role. Chefs can breathe easier – all we have to do is take the eggs, drop them into 63 degree Celsius water, and we can walk off and forgget them. Once the egg is warmed through, after 45 minutes or so, it stays there until quite a long time has lapsed. Would you like to one day be a chef/owner of your own restaurant? What would be the concept? I want to modernize and make gourmet “comfort food”. Many have tried, but even the chosen gods of our profession don’t go much further than putting better cheese into better bread for a grilled cheese sandwich. I want to take that a few steps further. If I had to elevator pitch it, I want to use the holy trifecta of art, craft, and science in the kitchen to make the best Mac and Cheese you have ever had. I would certainly be down with that. What city would you want to set up shop in? None of the big culinary ones. I am thinking about Austin, Dallas (came here for that reason), St. Louis, that kind. Professionally, what kind of cooking do you most enjoy making? I am a fan of the New Nordic Cuisine. Bold, strong, flavors with many undertones, always seasonal and always rather spartan in its ingredients. I am happiest when I get to play with tthe preservation, smoking, curing, aspect of the cuisine and when I can work with the ingredient over long time spans. When designing a menu, how do you draw the line between satisfying your desire to try new things, and satisfying the desires of the eating public? Where do you enjoy eating the most? Is there a place in this world where you find those beliefs to be especially cherished? The small bistrots and roadhouses in France and Spain. In the U.S. it’s hard to find them but sometimes a place comes along that celebrates those things. Manresa before it became famous, in Los Gatos, CA, for example. Chez Panisse in Berkeley. What topics do you find yourself doing more reading and less writing? Any Quora topics in particular? Quantum Theory, old languages, above all else. Coming home and having my son laugh and run towards me. Funny how stuff changes once you produce offspring. It’s all about perpetuating DNA, sure, but it does a hell of a number on most people’s perceptions of reality. My greatest fear used to be a catastrophic event like a quake, war, or something like that. Now it’s not being there to be able to protect my son from harm. Or failing to do so. The Brothers Grimm. They struck a fine balance between preserving history and lore, while being very experimental about things in their writing and publishing. And they were quite misunderstood :). In 43 versions of their book they often had to remove or add things because most people weren’t used to “that kind of story”. Over the decades, however, they really influence and changed things. Since you ask this of me in the context of cooking, I’ll narrow it down to that. Outside of the world of kitchens I admire a few people, from aid workers to human rights advocates, who are above anything in cooking. It’s hard to name just one, but in culinary sciences it’s definitely Herve This who didn’t let dogma and the “French style” get into his way to explore the boundaries of cuisine. My temper. It tends to flare, especially at work. Sheepishness and subservience. The willingness to accept without questioning, to take things at faith value. I find science and intelllectual pursuit to be the cornerstone and center of humanity. Any time someone asks if I got enough sleep. I am 5’6. I am statistically not able to become a CEO or COO in a Fortune 500, desirable to less than four percent of all females (according to a match.com survey), and my back is hosed from working in kitchens designed for 5’8 fellas. Three inches would be nice to have (no, not the kind that’s flooding my inbox, I speak stature). Nothing. My folks are perfect. Beating Cancer. Since you asked for achievements, not accomplishments, that’d be it :). I am well aware that anything in this regard was accomplished by the people who fought it for me, generations of researchers, and a lot of factors I can’t control, but somehow I managed it. Which makes it my most treasured achievement :). My dog. I’d be sleeping, eating, chasing squirrels, and basking on my porch all day. Hopelessness. The feeling that there’s nothing you can do to change what needs changing. Maybe on par with subservience. The men and women standing up and demanding democracy in places where this could very well mean pain or death. The aid workers flying into ravaged areas and doing what needs to be done, again often at the peril of their own lives. The French resistance during WWII. Happy, quickly, by myself, and listening to Louis Armstrong’s “Wonderful World”. It’s the end of my existence, might as well make it a fun event. “Shut up and get out of my way” if you ask my coworkers and friends. You are currently browsing the Uncategorized category at The Quora Review.